The best way to learn about what it is like to be a nurse. We created this section to provide more information about nursing careers so that you can get a feel for what it is really like to be a nurse. How to Choose a Nursing School - Looking into getting in the medical industry? In order to succeed and get a job in this competitive field one thing is certain, the technical skills you learn in nursing school are invaluable. Learn how to choose the right nursing school for you. Choosing a Nursing Career - There are tons of different nursing careers you can get into after nursing school. Choosing a specific career path can be daunting with so many field you can get into. Learn how to match you passions with your nursing career today. Top 5 Careers in Nursing - Can't decide what nursing profession to get into? If you are having a hard time picking out a nursing school specialty start by learning what the top five careers are in nursing. It is true that Nursing Education continues through a nurse's life. In the artcle on Continuing Education for Nurses, we review nursing continuing Ed and the types of training that nurses need. We also explore how to assess whether or not a nursing school is reputable in the the article on "Nursing School Accreditation." Be sure to review this article so that you are familiar with what types of accreditation are necessary in your state. We are also realistic that most people starting a nursing career have no idea how they are going to pay for their nursing degree, so we created a quick article on Financial Aid. We hope that you will find the information you need to start your nursing career. Be sure to check out the nursing schools we recommend. The best way to learn about what it is like to be a nurse? Ask one! That exactly what we did in "Interview with a Nurse." Our interview is with Jean Pachelbel, who grew up in Pennsylvania. Her experience is vivid and some would say typical for a nurse. The one thing we know for sure? This is a real interview with a real nurse. Men in Nursing examines the ongoing trend we are experienceing in Nursing: Men are becoming nurses. Nursing is not just for women anymore. We also provide three articles on some hot trends in nursing careers, Home Nursing, Travel Nursing and Nursing Relief Projects Overseas. Be sure to read about these great new approaches to nursing care. We sum up this section with an article that explains why Nursing Careers are so hot. The article entitled "The Nursing Shortage" emphasizes the need for nurses and why this is one career choice that will always keep you in demand. Are you aspiring to be an ultrasound technician? If so, you should look into ultrasound technician schools to attend so that you can reach your goals. These schools will offer different types of programs and different levels of education ranging from bachelors degrees to masters degrees. With the many different advances in ultrasound technology it is important to receive the right type of education. In many cases, ultrasound has been able to detect certain problems that other tests such as CAT scans and x-rays may not have been able to detect and thus save a persons life. When you attend ultrasound technician schools you will be taught how to properly operate sonography machines as this machinery takes a person who has expert skill to not only operate it but to properly read it. The field of nursing is not only a huge industry but a growing one as well. Nursing jobs are becoming more and more specialized resulting in more positions being created and needing qualified nursing school graduates to fill them. Here are some details on five sub-category nursing fields that offer many positions therein. Find out which one is right for you! Gina Garrison* always knew she wanted to be a nurse. As a child she battled with asthma and other illnesses, so nursing school seemed like a natural fit. Gina worked for many years on the hospital floors; comforting patients, working with doctors, and ensuring that the patients got quality care. Deciding to become a nurse is just the first step. Once you have made that decision you must then decide what kind of nurse you would like to be- an LPN, RN, or BSN. Each of these types is distinctly different in terms of career options, responsibilities, and required education. Once you have decided on a nursing profession you can select a nursing school. To help you understand what each of these entails, here are some basic descriptions of each. Before considering nursing school, you may be curious about what your earning potential would be as a nurse. 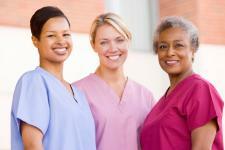 The nursing profession is considered to be fairly well-paying. Another perk of being a nurse is that it is practically recession-proof, and the current shortage of nursing professionals would ensure a relatively quick and painless job search. Chicago called to you after nursing school. You wanted to work in a busy hospital where your skills would be put to the test. You also wanted to live in a city that could give you exciting new experiences around every corner. So, you signed up with a travel nursing agency to find openings in one of the many hospitals in the city. Nursing is considered by many to be a rewarding and exciting career. From assisting doctors in the operating room to patient rounds and personal care, nurses have a very important role in the field of medicine. However, for those who dare, there is a world of opportunity above and beyond uniforms and hospital beds. That opportunity lies in the world of overseas volunteer nursing. You have finished school. You found a job that allows you to use your skills. Now your supervisor wants you to take more classes? You read that right. More classes. Nurses at all levels are expected to take a certain amount of continuing education class hours each year to requalify for their licenses. Each state determines how many hours you will need to take over a two-year period—Michigan requires 25, while California asks for 30. How would you like a new career that gives you flexible working hours, on-the-job variety, personal fulfillment, job security, opportunities for advancement and travel, great salary and benefits, and the chance to make a real difference in the lives of patients? You know you want to be a nurse, you know what school you want to go to, but you have no idea how you'll pay for it. Don't worry, you aren't alone. Between books, tuition, and everything else you'll need when you start classes, you will need to get to work on finding funding. It is common knowledge that the US is facing a nursing shortage. Most often you will hear the cause is due to a population that is living longer than ever before. What makes the problem worse is that nursing schools can't enroll as many students as are needed in the workforce. You've already earned your certificate or degree as a Certified Nursing Assistant (CAN), LPN or RN, but would like to increase your earning potential, or take on a more challenging role in a hospital or healthcare institution. What additional educational training do you need in order to take your nursing career to the next level, and will the extra investment in school really pay off? Nursing isn't just "women's work." Women's liberation works both ways in nursing. More men enroll in nursing school every year. In fact, the 2000 National Sample Survey of Registered Nurses found that men made up nearly 5.4 percent of registered nurses in the US. That number is expected to grow. An important thing to check for when enrolling in nursing school is what type of accreditation the school has. Think of accreditation as a gold star for the school. It says that the school has been reviewed by nursing organizations and found to have an acceptable curriculum. Different nursing programs require different accreditation, so you'll need to do your homework. Q: What drew you to nursing? Were other members of your family nurses and doctors? Jean Pachelbel: When I was six years old, I was a patient in a hospital for a tonsillectomy. The nurse who prepared me for surgery came in to my room to give me a pre-operative injection. She stood beside me and raised the syringe to make sure there were no air bubbles in it. The needle was just above my head. Forever improving the landscape of a relatively new profession, these impassioned and prolific Nurses established ever higher standards for the well being of the sick, injured, and disabled. Every nurse should strive to accomplish as much in the advancement of the care and condition of the people who need it the most.